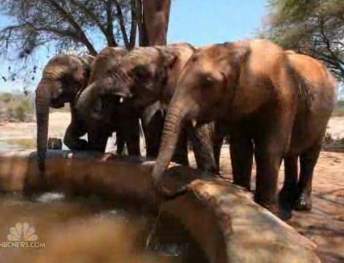 A woman is saving the orphan calves of African elephants illegally hunted to satisfy the ivory trade in Asia. The 900-pound toddlers crave a mother’s nurturing but have been left motherless by poachers. 30 years ago, the conservationist Daphne Sheldrick set up the world’s first elephant orphanage in Nairobi, Kenya. The animal keepers teach helps them teeth, sleeps alongside them and serves them milk every three hours. WATCH the story below, reported by Chelsea Clinton – READ the story at NBC.